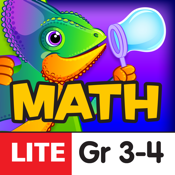 An excitement-filled app that helps kids boost level-appropriate math skills…while they play! Children race to solve math problems by popping bubbles that show the correct answers…before they splash into the pond! Up to 4 players can compare scores. Download Multiplication FREE! Additional subjects are $0.99 each…or get all three for $1.99.